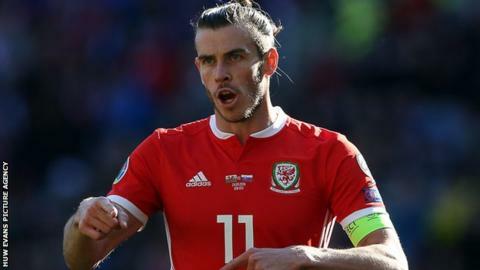 Joe Allen says Real Madrid's Champions League exit means Gareth Bale will be fresh for Wales' Euro 2020 qualifiers in June. Bale missed Wales' friendly against Mexico in May 2018 due to his involvement in the Champions League final, in which Real beat Liverpool 3-1. Real were knocked out of this season's competition by Ajax in the last 16. "But it's good news for Wales, he's so key to us," Allen said. "We want to keep him wrapped up in cotton wool as much as we possibly can and make sure he is ready to fire in the summer. I'm sure he will be. "I think it's important for us that we all go back and do well for our clubs and hopefully take good form into the two important away games in the summer." Wales, who began their Euro 2020 campaign with a 1-0 win over Slovakia, face Croatia in Osijek on 8 June and then Hungary in Budapest on 11 June. Allen says the emergence of Wales' youngsters means senior players cannot "rest on their laurels". Their starting line-up against Slovakia in Cardiff included only four survivors from the side which beat the same opponents in 2016. Ryan Giggs' team included seven players with fewer than 10 caps. "Football moves forward quickly and the young lads have come in and done great," Allen said. "There's been a lot of change in the last couple of years. The young lads have come through and really pushed for places in the team. "It has made sure that the senior lads are in a position where you can't rest on your laurels and you have to do everything you can to keep your shirt." Stoke City's Allen played alongside 19-year-old Matt Smith in midfield while Giggs handed starts to 21-year-old Daniel James and fellow wingers David Brooks (21) and Harry Wilson (22). Chris Mepham, 21, and Swansea City's 23-year-old Connor Roberts started in a defence which also included James Lawrence, winning only his third cap. Allen, who was among a crop of youngsters given his opportunity by former manager John Toshack, says new faces have given the squad a boost after their failure to qualify for the World Cup. "The quality of the young lads has made that happen. They have done great when they have been given the chance," Allen added. "As one of the more senior lads, there's a group of us who know that we have so much more still to give. "It's going to be about blending the two and we have done that well so far. "We have had fantastic team spirit for years. "I think the young lads have really appreciated coming into a group that has that sort of environment and the onus is going to be on everyone - whether they are young and old - to make sure we keep that."